To be a jump jockey requires courage, resilience and a significant amount of balls. And, with the jump season officially underway on Thursday 17th October at Wincanton Racecourse, the Somerset track today presented Professional Jockeys Association members with a triple pack of golf balls. The branded Wincanton Racecourse golf balls with the featured tag line – not everyone has the balls to be a jump jockey – will be used throughout the season in an on-course golf contest which will take place in the Parade Ring. "Our Wincanton branded golf balls are the perfect product to celebrate our forthcoming season that includes 17 fixtures featuring the Badger Ales Trophy, the Kingwell Hurdle and other competitive contests. "We have the utmost respect for our sportsmen and our seasonal golf contest will provide race-goers with additional entertainment; seeing the likes of AP McCoy, Daryl Jacob and other top jockeys in a different sporting role. The chipping challenge will have a fundraising element supporting the winning jockey's charity of choice." Wincanton's opening meeting – Under Starters Orders - on Thursday 17th October will stage a parade of racehorses, featuring some of the stars from the West Country. Among those set to parade are Grands Crus, trained by David Pipe, who is set to reignite the jump season once again this season. Other big names to parade include the Paul Nicholls-trained Big Bucks with 23 wins and more than £1.25m in prize money to his name, plus the Wincanton superstar Celestial Halo. Horses from the yards of Colin Tizzard, Harry Fry and Jeremy Scott will also join the parade hosted by Channel 4 presenter, Alice Plunkett, and Luke Harvey. Gates open at 12:30pm with the first race of six races off at 2:20pm. 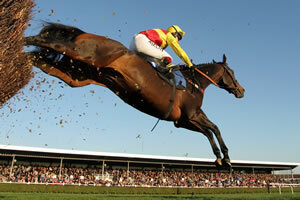 A £5 discount is available on all tickets when booked in advance on 0844 5793014 or wincantonracecourse.co.uk.